I vividly recall hauling around a massive MagLite because, at the time, they were the best flashlight money could buy. There I was, a strapping young lad being raised on a small farm in Iowa. I remember dragging that huge flashlight around (you know, the one with three D-cell batteries in it) just so I could see what the heck I was doing at the crack of dawn. Because, as you know, those morning chores “won’t do themselves”. I also remember many late nights holding that stupid MagLite. Keeping the beam perfectly steady so my Father could swap out a broken bearing on our combine (or some such emergency farm repair). I dare you to hold a full-size MagLite up in the air for 3 hours straight. You’ll feel like your shoulder is about to fall off. Trust me, having a sore shoulder was far better than “getting lazy with the flashlight“. My Dad still hates excuses and words like “lazy” or “can’t” set him off. Boy, I wish I had a FireHawk in my pocket back then. So along comes modern technology and the shrinking of components and the increases in efficiency…and all that. Let’s just say, the LED changed the world of flashlights forever. Here are the 3 reasons why the FireHawk is the best EDC flashlight I’ve ever owned. First off, these FireHawk’s are rock solid. They have a “solid feel” to them. You know the feeling. It’s hard to describe, but when you feel it…you just know. They just have a “solid feel” to them. You know the feeling. It’s hard to describe, but when you feel it…you just know. And it’s the little things that give you confidence in its design. The first thing you’ll notice, after you unscrew the tail cap to add your single AA battery (because that’s all it takes), is that the threads are both clean and precise. You’ll also see a little rubber gasket that helps keep the battery chamber dry when it’s raining out. For grip, this EDC flashlight has two strategic diamond print patterns machined into the aircraft-grade aluminum body. These patterns are ideally located for improved grip. It also has a section of deep grooves where your fingers tend to make contact. This helps ensure it’s not the flashlight’s fault if you drop it. But this tough little EDC flashlight is going to survive a lot of 6-foot tumbles, no problem. The belt clip is also quite strong. Keeping your FireHawk in place at all times. Knowing it’s secure in your pocket (or on your belt) and that it’ll be there when you need it. I’ll be honest, the first time I held one, I was both surprised and impressed with how much heft these FireHawk’s have for such a small package. It’s still ridiculously lighter (and smaller) than a full-size MagLite. But it’s surprisingly heavy and dense for its small size. Which is a testament to its high-quality construction and use of dense aircraft-grade metal. The real bright spot (pun intended) with this EDC flashlight is the number of lumens this little guy produces. It’s specified for up to 300 lumens. Now 300 lumens might not seem like a lot, but remember this is a small pocket flashlight that only takes a one double A battery. So for its size, it’s super bright! Whether you’re hunting, hiking, camping, looking for your electrical panel in the dark, working on your lawn mower, or bugging out, this powerful EDC flashlight has the ability to light up your world. Plus, you can control the brightness with the sliding tip. It has both spill lighting and spotlighting settings. Slide the tip all the way back for full spill lighting and slide it all the way forward for tight spotlighting. You’ll notice the sliding function of the tip has just the right amount of resistance. Too much resistance would make it difficult to slide, and too little would allow it to slide around on its own. But this well-designed flashlight has found the perfect resistance sweet spot. Not too tight, but not too loose. Again, I can’t help but repeat myself, I’m blown away by how bright this flashlight is. When I was walking around the outside of my house at night I could see everything. It brightened up everything in front of me like it was day. Of course, I tested the spotlight setting too and was surprised at how far it traveled. I could see the spotlight hitting a stop sign over two full blocks away from my house. It’s so freaking bright you have to be careful. Do NOT shine this flashlight directly into someone’s eyes. It will temporarily blind them, and it will hurt. Which is actually a nice little bonus for self-defense reasons. 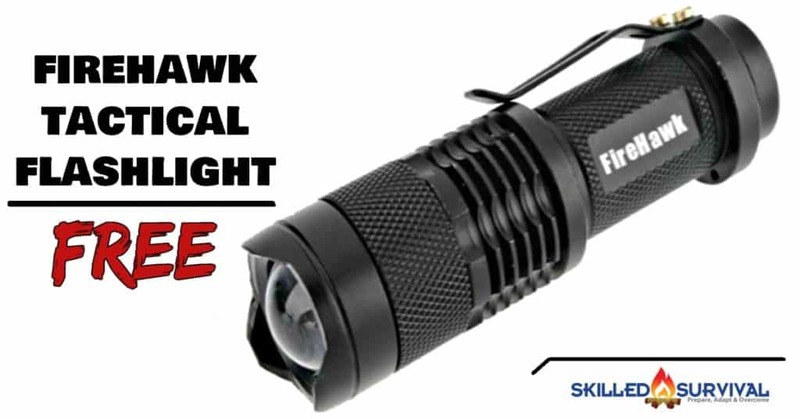 If you happen to have a Firehawk LED Tactical Flashlight in your hands and are attacked, shine it directly into your assailant’s eyes. They’ll be temporarily blinded and quickly become disorienting by the super bright beam. Which will buying you a bit of time to attack first or flee the scene. “it’s the brightest LED tactical flashlight I own”. It’s the little things that make a good EDC flashlight worth carrying. Another useful design feature with this LED flashlight is its slightly recessed power button. Having the button recessed helps to prevent accidental activation. We’ve all experience bumping our electronic devices and accidently turning them on. Only to discover a dead battery when you go to use it. Not fun. So this feature is very helpful. The recessed button also allows this EDC flashlight to stand on its tail end with the lens facing up. When set down this way, you can light up an entire room…hands-free. This is perfect if you’re working alone and you need both hands. Just set this flashlight bulb up (tail down) and you’ll be able to see well enough to accomplish most basic tasks. Now I prefer to carry all my EDC gear incognito. I’m not trying to look “cool” as the kids say, instead, I want to carry all my EDC gear and no one even notice. And that’s what you can expect with this small pocket flashlight. When it’s in my pocket it barely sticks out. Hiding the majority of the flashlight from plain view. Perfect. Finally, the lens of the FireHawk has a convex shape (curved out). In order to protect this lens (and allow you to set the flashlight tip down), 3 beveled prongs were added. A side benefit of these 3 beveled prongs is that they can be used as a weapon themselves if push came to shove. Hitting someone in a strategic location with these metal prongs could inflict some serious damage. So the FireHawk LED has become my new EDC flashlight. It’s replaced my old MagLite long ago. I love it so much I added one to my bug out vehicle and bug out bag as well. I love it so much I added one to my bug out vehicle, bug out bag and my EDC backpack as well. I carry a FireHawk Flashlight with me every day and everywhere I go. And you should, too. Click the image below and I’ll send you one for free. All I ask is you cover the shipping and handling.